In May of 2016 Sonia and I sold our house north of Seattle along with our cars and almost all our belongings and spent the rest of the year traveling through South America and Mexico with just carry-on size backpacks. 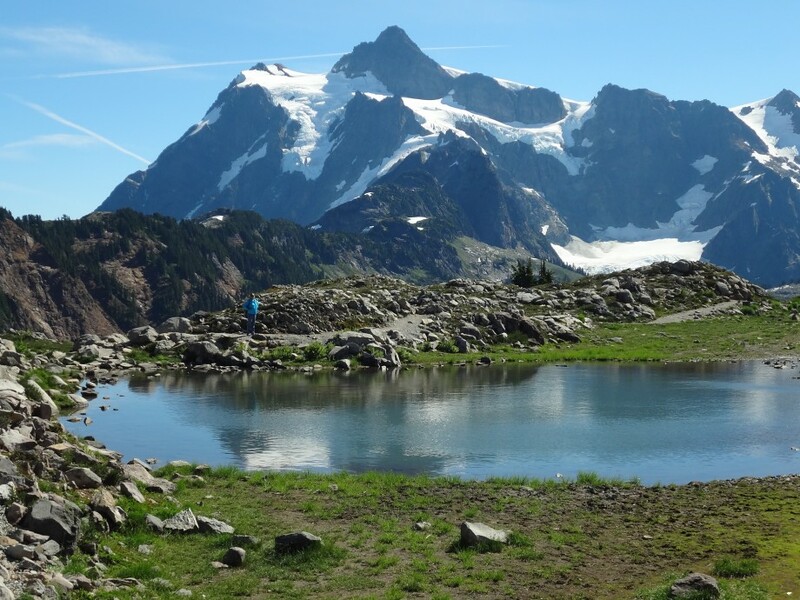 You can read about these adventures in our Trip Reports section. But now we were ready for something different. We knew before we left that when we returned from South America we wouldn’t have a home to return to. So, we planned in a break after we returned from South America to take some time to decide what to do next. The ideal place for us to do that was in Chihuahua Mexico where Sonia’s family lives and we had a comfortable apartment to stay in. The choices were to either continue traveling in our backpacks to Southeast Asia maybe The Balkans, retire our backpacks and invest in a recreational vehicle (RV) to travel North America from Alaska to Baja California, or give up traveling altogether and settle back down, maybe in the Seattle area, or possibly the southwestern U.S. or Mexico. So, as we relaxed over the Christmas holidays in our comfortable apartment in Chihuahua we considered all of this. Finally, we decided it would be the RV; in our case a heavy duty pickup truck pulling small fifth wheel trailer which would allow us to access remote areas. We were ready for more adventure, but after ten months of living out of small backpacks we were ready for more comfort too and as a bonus the RV would provide us a home as well. We were now itinerant; gypsies without a permanent “fixed” address, and that makes buying and registering vehicles, insuring them, getting health insurance, receiving mail, voting, and filing income taxes more complicated. But our research revealed that many “full-time” RVers (people living full time in their RVs) use mail forwarding services which provide street addresses that appear like an apartment address. Further, there are a few “RV-friendly” states that officially recognize these mail forwarding addresses as legal addresses so you can use it to register vehicles, buy insurance, and register to vote. Some of these mail forwarding services include scanning of your incoming mail so you can see online what mail you are receiving and have it forwarded to you or shredded and disposed of. Better yet, some of these mail forwarding services provide assistance for registering your vehicles, buying vehicle and health insurance, registering to vote, and other assistance for long distance travelers. So, you can do all of these things as if you were in a fixed home when you are actually traveling all over the country. Florida, Texas and South Dakota are particular favorites with full-time RVers for establishing residency. We chose South Dakota since you can become a resident of the state by staying there just one night and getting a South Dakota driver’s license. As a bonus, taxes in South Dakota are low. Now, how to get there? We left Chihuahua in early March and stayed with friends in Santa Fe, New Mexico for almost a week. Then we rented a car in Santa Fe and drove to Rapid City, South Dakota, spent three days there getting drivers licenses and voter ID cards and voila! – We were now residents of South Dakota. That part done, it was time to invest in our RV; a truck and trailer. Through research we had identified the fifth wheel trailer that fit our needs; a Fox Mountain fifth wheel trailer built by Northwood Mfg. in Oregon. Small by fifth wheel trailer standards, the 235 RLS Fox Mountain is well insulated, well-built and designed to be taken far into the outback where we wanted to go. We would need a powerful truck to pull the heavy trailer and decided on a one-ton pickup truck with a diesel engine, four door cab, and four-wheel drive. This stuff is expensive and the Mountain Fox trailers are so sought after that used ones are almost impossible to find. But, we had located some RV dealerships in Washington State and Oregon that sold new ones at good prices plus we had things in storage near Seattle that we would need. On top of that we wanted to investigate some property for sale outside of Seattle where we might establish a home base. So, mid-March we drove the rental car to Denver, Colorado and flew to Seattle, Washington to begin our investment in our new, full-time RV life. There we rented another car and stayed with friends while we searched for a truck. Within three days we had bought a used 2016 one-ton Dodge Ram 3500, diesel, crew cab, four-wheel drive with just 9,600 miles on it and still on warranty. We called it The Beast and I’d never driven such a huge pickup truck and we had to have running boards installed on it just to climb up into it. In the meantime, miraculously, we had located a used Fox Mountain trailer at a small dealership in La Grande, Oregon. So, we drove the huge pickup truck to Richland Washington near La Grande and stayed with friends there while our South Dakota license plates caught up with us. 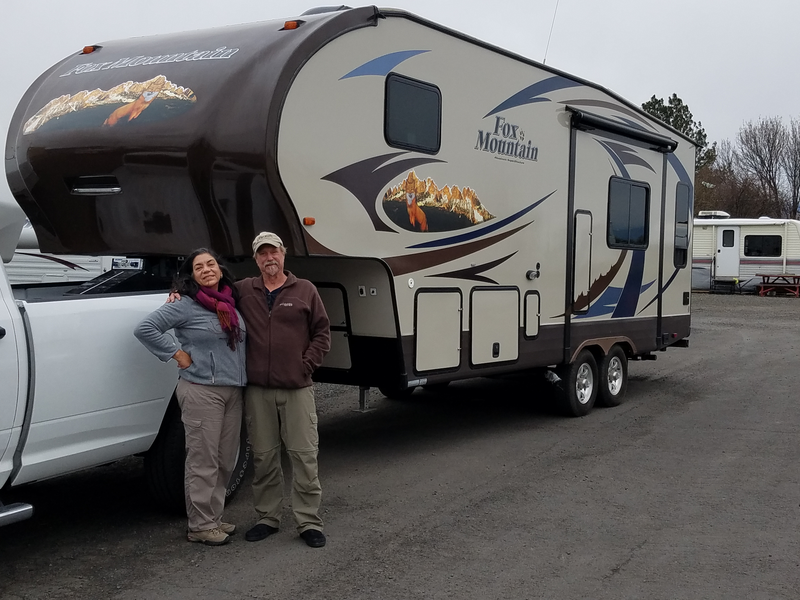 A week later we signed off on the like-new 2014 Fox Mountain fifth wheel trailer in La Grande. Suddenly we were RVers, though we didn’t even know how to hitch the trailer up to the truck yet. The friendly folks at Thunder RV in La Grande installed the fifth wheel hitch in our truck, trained us how to attach it to the trailer, and let us spend the first night in their dealership. After that we drove back to Richland finding that the powerful truck easily handled the heavy trailer and set it up at a friend’s ranch for the next two weeks to practice operating all the systems in it. We jumped into full-time living in a RV in about the most difficult way possible. We’re amazed we even pulled it off as well as we did, but we made mistakes. Normally, people who decide to start living in a RV do so from the convenience of home before committing to a nomadic lifestyle. But we had no home to return to, no experience living in a RV, and buying a truck, trailer and all the equipment is expensive. And, we were doing all this remotely while staying with friends or from our apartment in Mexico. A thousand questions came up. We had figured out the legal issues of registering vehicles by establishing the South Dakota residency, but other issues worried us like the cost of living in a RV full-time. Where will we go with it? Will we even like it? How will we get along living together in a 220-square foot space? Some of these questions we answered through thorough research, planning and budgeting. We could afford the initial expense if we bought used vehicles. Our monthly budget would be about the same as traveling in our backpacks so long is we traveled slowly, staying at each destination for days or weeks at a time. I’m on Medicare, Sonia has private travelers’ insurance, and we both have access to medical service in Mexico. Even though the address we established in South Dakota provides us a street address, we found that these permanent mail box (PMB) addresses are well known to banks, vehicle dealerships, insurers, and the IRS and they don’t recognize it as a “fixed address” like a house or apartment. That makes it almost impossible to establish a bank account or get a loan. To make matters worse, the South Dakota Department of Licensing issued our drivers licenses with “PMB” printed on our licenses further flagging us as not having a permanent address. In our case we were buying everything for cash and we didn’t need to start new bank accounts or make loans so it wasn’t a problem for us, but that could be a major problem for someone else. Buying trucks, trailers and the equipment for them while traveling from place to place was more difficult than we anticipated and we tended to get into a rush, got exhausted and sometimes spent more than we need to. Being tired and in a rush while buying big-ticket items is a bad mistake, but we still managed to buy the truck, trailer and all the equipment for it within the budget we had planned. By the end of April we were sick of shopping and spending. We misjudged the stress of moving into RV life while already being itinerant. We got overwhelmed trying to learn how to operate a new truck, new trailer, and all of the equipment needed for long-term travel (portable generators, water purification systems, electronic and security gear in the trailer). And, we were also learning how to use all the mobile applications for navigating around the country with a smart phone while already traveling. This would have been much easier from the comfort of a fixed home and I spent too many sleepless nights worrying about all of it (Sonia adapted almost immediately and was much more relaxed). On the other hand, within a week of buying the trailer I had learned how to back it up into tight parking spots and we had it fairly-well equipped. By the beginning of May 2017, we’d settled into our “new home” while continuing to learn how to operate it. All the stress of buying expensive vehicles and equipment has faded and we’ve found that living in a 220-square foot trailer is easy and exciting. It has a solar system to charge the batteries, full entertainment center with TV and internet, refrigerator with freezer, and a complete bathroom with shower. For a small, 27-foot long trailer, it’s amazing how much storage space it has and we have it loaded up with mountain bikes, inflatable sea kayaks, a portable outdoor kitchen, a generator, my guitar and banjo, hiking gear, and all the clothes we’ll need for the next year. We like living full-time in our small trailer, but how long will we do this? Only time will tell. But right now the road is calling us and we can’t wait to set up in the canyons, deserts, mountains, beaches and forests of western North America. We don’t have any plans to stop anytime soon.